The End of Another Seminary Semester (Dec. 2018), a New PRT Journal Issue, and Updated Addition Work Pics! Today marked the last official day of the first semester at the PRC Seminary. It was exam week, and while no exams were actually held today (Friday), students had papers to finish and turn in today. And thus, another semester comes to a close. The end of another semester is always a bit sobering. We stand amazed at how quickly 15 weeks of classes go by. And yet there was marvelous Reformed instruction given again by the faculty, and growth in grace and knowledge and gifts on the part of the students. Our two seniors (Jacob M. and Matt K.) were mostly absent from us (and yet they mysteriously seemed to appear in time for our “Friday brat/burger” lunch), busily engaged in the work of their internships, getting a taste of the “real” life and labors of a church pastor. It was obvious they loved the experience and are being made ready for the grand goal. Soon they will return for their final semester (where did those four years go?!). Humbling, all of it. Our new professor (D. Kuiper) is working quickly toward the goal of his advanced learning too, starting to write his main thesis for his ThM degree through Calvin Seminary. Next fall, Lord willing, he will begin teaching some of his courses. A new secretary moved in mid-semester (Sharon K.), to take the place of our beloved Mrs. J. Doezema, who has only “retired” to less work (“just” the manifold denominational labors she is involved with, and the Standard Bearer). But grace was given to both ladies to take up and to carry on, and the transition has been as smooth as it could be. We praise God. We were also able to produce our 103rd PR Theological Journal – Volume 52, No.1 (Fall 2018). As you will see from the cover, it is another fine blend of Reformed scholarship and practical theology, with articles and book reviews to benefit preachers, teachers, students, and laymen. The pdf may be found here; the print copies came in today and will be mailed out or delivered next week. If you would like to be added to our mailing list to receive the PRTJ (free! ), contact the seminary at 616-531-1490 or seminarysecretary@prca.org. God is good. His grace is abundant, and therefore amazing. We see His hand guiding us for good in all things, and we give humble thanks to Him for another semester. Remember us in prayer, even as we remember you. I include here a few other pictures taken throughout the semester, with a few notes for each. Enjoy! We are blessed by many visitors during the semester, sometimes from faraway places, such as Singapore. Once again, I was personally blessed by the help of Kevin R. and Elijah R. in the library. Once again the sem (and pre-sem) student ping-pong team showed itself highly competitive, winning 50% of its games. And in the animal realm, a red fox made a rare appearance one night when our janitor was here. He was able to capture a quick shot of it for all of us to enjoy. Finally, we note that, while Pres. D. Trump is having trouble getting his border wall built, the new seminary addition’s walls made good progress this week, thanks to some mild weather and Bouwkamp Masonry. The new archives and offices are taking shape! Merry Christmas from all of us at the seminary! May the joy and peace of our sovereign Savior be yours in this season of the year. This story has been carried by several news sources in the last few weeks, and I thought it interesting enough to post it too. This is the opening part of the news about the fascinating discovery; find the rest at the link below. Cologne is one of Germany’s oldest cities, founded at the beginning of the first millennium as a Roman colony, and it’s the sort of place where if you dig into the ground, you can find something spectacular. In 2017, a Protestant church was working to build a community center and unearthed a set of ancient walls, which dated back to the city’s Roman era. The building had been large enough to have some notable purpose, but archaeologists initially weren’t sure what that might be. They had discovered niches in the walls that seemed too small for statues. But when they compared those features with other Roman-era buildings, they were convinced they knew what the building had been used for. It had been a library, the oldest identified in Germany. I recently completed my list of “significant additions to the PRC Seminary library” for the second quarter of this year (April – June). I began this two years ago for the benefit of the faculty and students as well as for the Theological School Committee. By the way, these lists are now being published in our PR Theological Journal, although our last issue (Spring 2018) was too full and we had to leave the last two quarters out. Hopefully, we can catch up in future issues. I hope this list not only gives you a feel for the quality of resources we are adding to our library, but also inspires you to find one to read and perhaps even add to your personal or family library. Baker Commentary on the Old Testament: Psalms: Volume 1 (1-41) & Vol.3 (90-150), John Goldingay; Tremper Longman, III. — 1st-hc. — Grand Rapids, MI: Baker Academic, c2006. o A Commentary on the Song of Songs / Richard Brooks. Fearn, Ross-shire, Scotland: Christian Focus, 1999.
o Ephesians: Encouragement and Joy in Christ / Paul Gardner. – Revised ed. ; Fearn, Ross-shire, Scotland: Christian Focus, 2007.
o 2 Peter and Jude / Robert W. Harvey; Philip H. Towner; Grant R. Osborne. Downers Grove, IL: InterVarsity Press, c2009. o Jeremiah, Chapters 21-52: An Introduction and Commentary, Volume 2 / John L. Mackay (2004). Reformation Commentary on Scripture, OT & NT (IVP) – Jeremiah, Lamentations / J. Jeffery Tyler, ed. ; Timothy George, gen. ed. Downers Grove, IL : InterVarsity Press, 2018. Tyndale NT Commentaries: The Epistle of Paul to the Ephesians: An Introduction and Commentary / F. Foulkes, W. B. Eerdmans, c1963, 1975. Has the Bible Been Kept Pure? : The Westminster Confession of Faith and the Providential Preservation of Scripture / Garnet H. Milne; David J. Engelsma. Australia: Independently published, 2017. How to Study the Bible / John MacArthur. Chicago, IL: Moody Publishers, c1982, 2009. Saving the Bible From Ourselves: Learning to Read & Live the Bible Well / Glenn R. Paauw. Downers Grove, IL: IVP Books, 2016. A Biblical-Theological Introduction to the New Testament: The Gospel Realized / Michael J. Kruger. ; J. Ligon Duncan III. ; Guy Prentiss Waters. ; Michael J. Kruger. — 1st-hc. — Wheaton, IL: Crossway, 2016. Coping with Change: Ecclesiastes / Walter C. Jr. Kaiser. Fearn, Ross-shire, GB: Christian Focus, 2013. The Gospel According to God: Rediscovering the Most Remarkable Chapter in the Old Testament [Isaiah 53] / John MacArthur. Wheaton, IL: Crossway, 2018. Interpreting the Parables / Craig L. Blomberg, 1955-. — 2nd, rev. and expanded. Downers Grove, IL: IVP Academic, c2012. Paul: A Biography / N. T. Wright, (Nicholas Thomas). San Francisco: HarperOne, 2018. Be Joyful: A New Testament Study – Philippians / Warren W. Wiersbe. Wheaton, IL: Victor Books, c1974. Irenaeus: Life, Scripture, Legacy / Sara. Parvis; Paul Foster. Minneapolis: Fortress Press, c2012. The First Thousand Years: A Global History of Christianity / Robert Louis Wilken. New Haven and London: Yale University Press, 2012. The Reformation / Cameron A. (Cameron Alexander) MacKenzie. St. Louis, MO : Concordia Publishing House, 2017. Fatal Discord: Erasmus, Luther, and the Fight for the Western Mind / Michael Massing. New York, NY: Harper / HarperCollins Publishers, 2018. Jonathan Edwards, Evangelist/ John H. Gerstner. Orlando, FL: Northampton Press, 2018. The Belgic Confession: A Commentary, Vol.1 / David J. Engelsma. Jenison, MI : Reformed Free Pub. Association, 2018. By This Our Subscription: Confessional Subscription in the Dutch Reformed Tradition Since 1816 / Roelf C. Janssen. Kampen: Theologische Universiteit, 2009. Dictionary of Latin and Greek Theological Terms: Drawn Principally From Protestant Scholastic Theology / Richard A. (Richard Alfred) Muller (2nd ed.) — Grand Rapids, MI: Baker Book House, c1985, 2017. Canonical Theology: The Biblical Canon, Sola Scriptura, and Theological Method / John Peckham; Craig G. Bartholomew. Grand Rapids, MI: Wm. B. Eerdmans, 2016. In the Beginning, God: Creation from God’s Perspective / Joel D. Heck. St. Louis, MO: Concordia Pub. House, c2011. The God of Creation: Truth and Gospel in Genesis 1 / Richard D Phillips. Welwyn Garden City, UK: EP BOOKS, 2018. Friends of the Law: Luther’s Use of the Law for the Christian Life / Edward. Engelbrecht. St. Louis, MO : Concordia Pub. House, 2011. Being In Christ: A Biblical and Systematic Investigation in a Reformed Perspective / Hans Burger. Eugene, OR: Wipf & Stock, c2009. Peter Ramus and the Educational Reformation of the Sixteenth Century / Frank P. (Pierrepont) Graves. New York: The Macmillan Company, 1912. Cartesianism in the Netherlands, 1639-1676: The New Science and the Calvinist Counter-Reformation / Thomas A. McGahagan — Philadelphia: University of Pennsylvania, 1976. A Covenantal Confession: Geerhardus Vos and the Doctrine of the Covenant in the Westminster Confession of Faith / Eric B. (Brian) Watkins. Reformed Theological Seminary, 2009. A Question of Consensus: The Doctrine of Assurance after the Westminster Confession / Jonathan. Master. Minneapolis, MN: Fortress Press, 2015. Jus Divinum: The Westminster Assembly and the Divine Right of Church Government / John Richard. De Witt. Kampen : J. H. Kok, 1969. 20th-Century Theology: God & the World in a Transitional Age / Stanley J. (Stanley James) Grenz, 1950-2005; Roger E. Olson. Downers Grove, IL: InterVarsity Press, c1992. Determined to Believe: The Sovereignty of God, Freedom, Faith, and Human Responsibility / John C. Lennox. Grand Rapids, MI: Zondervan, 2018. Kept for Jesus: What the New Testament Really Teaches About Assurance of Salvation and Eternal Security / C. Samuel Storms. Wheaton, IL : Crossway, 2015. High King of Heaven: Theological and Pastoral Perspectives on the Person and Work of Jesus / Michael Reeves; Paul Twiss; Mark Jones; John MacArthur. Chicago: Moody Publishers, 2018. Retrieving Eternal Generation / Fred Sanders, (Fred R.), editor; Scott R. Swain, editor; Donald A. Carson. Grand Rapids, MI: Zondervan, c2017. Pleased to Dwell: A Biblical Introduction to the Incarnation / Peter Mead. — Revised-pb. — Fearn, Ross-shire, GB: Christian Focus, 2015. Between Wittenberg and Geneva: Lutheran and Reformed Theology in Conversation / Robert Kolb; Carl R. Trueman. Grand Rapids, MI: Baker Academic, 2017. New Calvinism: New Reformation or Theological Fad? / Josh Buice. ; Paul Washer; Steven J. Lawson. — Revised ed. — Fearn, Ross-shire, GB: Christian Focus, 2017. A Christian’s Pocket Guide to Mary: Mother of God? / Leonardo de Chirico. — Fearne, Ross-shire, GB: Christian Focus, 2017. Heaven on Earth: What the Bible Teaches About Life to Come / Derek Thomas. Fearn, Ross-shire, GB: Christian Focus, 2018. The Pleasures of God / John Piper, Portland, OR: Multnomah Press, c1991. Advancing Trinitarian Theology: Explorations in Constructive Dogmatics / Oliver Crisp, editor. ; Fred Sanders, (Fred R.) , editor. Grand Rapids, MI: Zondervan, 2014. Lutheran Worship: History and Practice / James Leonard. Brauer; Fred L. Precht. St. Louis, MO: Concordia Publishing House, c1993. Out of the Blues: Dealing With the Blues of Depression and Loneliness / Wayne Mack. Bemidji, MN: Focus Publishing (MN), 2006. Reformed Theology and the Style of Evangelism / John H. Leith. ; James C. IV Goodloe. — Eugene OR: Wipf & Stock Pub, 2010. Resilient Ministry: What Pastors Told Us About Surviving and Thriving / Bob Burns, 1950-. ; Tasha Chapman; Donald Guthrie. Downers Grove, IL : InterVarsity Press, 2013. The Heart of an Executive: Lessons on Leadership from the Life of King David / Richard D. (Richard Davis) Phillips. New York: Doubleday, c1999. God’s Problem: How the Bible Fails to Answer Our Most Important Question–Why We Suffer / Bart D. Ehrman. New York: HarperOne, c2008. A Well-Ordered Church: Laying a Foundation for a Vibrant Church / William Boekestein; Daniel R. Hyde; Cornelis P. Venema. Welwyn Garden City, UK: Evangelical Press, 2015. Elders and Deacons and Saints, Oh My! : Defining Biblical Roles, Structure and Organization for a Team Ministry That Achieves the Fivefold Purpose of the Church / James Kirkland. Bloomington, IN: Crossbooks, 2011. God’s Solutions to Life’s Problems: Radical Change by the Power of God / Wayne A. Mack; Joshua Mack. Phillipsburg, NJ: P & R Publishing, 2014. Broken Vows: Divorce and the Goodness of God / John Greco. Adelphi, MD: Cruciform Press, 2013. Expository Exultation: Christian Preaching As Worship / John Piper, Wheaton, IL: Crossway, 2018. God Among Sages: Why Jesus Is Not Just Another Religious Leader / Kenneth R. Samples. Grand Rapids, MI: Baker Books, 2017. We might be a little biased, but we believe reading is an essential part of childhood. Teachers and schools can teach you many useful things (and some not so useful) but a steady diet of literature can ensure a child’s education never ends. Some kids are born bibliophiles, while others can’t be bothered with books. The challenge for any parent, teacher or librarian is finding the books that turn reluctant readers into voracious ones. But how do you know which children’s books will do the trick? Reading comes much easier if you read about what you love, so let your little reader decide. One book usually leads to another. To help get you (and your young reader) started, we’ve gathered up 50 great books for kids. The list ranges from picture books for young children like Goodnight Moon and Where the Wild Things Are, to little novels for independent readers like The BFG and Stuart Little. Even if your child isn’t quite ready to read big books on their own, series like Harry Potter and The Chronicles of Narnia are fun to read out loud and will please children (and adults) of any age. Our list of the best books for children includes brand new books, Newberry Award-winners, and timeless classics you’ll remember from your own childhood. Head down the page to the comment section to leave your own suggestions! Happy reading. We couldn’t agree more, and think you will find something for your youngster in this great list. Be sure to visit the link below to get a glimpse of the wonderful collage of colorful covers to these children’s classics. Won’t you take some time to read to your child today, or put a good book in his/her hands for them to read? Harvard Law School in Cambridge. Compliments of “I Love Libraries” (part of the ALA), we have this recent focus on the amazing library collection of the Harvard Law School. So, for our Thursday history/archives feature, let’s take a look at this library and its collections. Over the past 200 years, Harvard Law School (MA) has built a collection of primary and secondary law unsurpassed by any other academic law library in the world. In 1868, the library, then on the first floor of Dane Hall, was managed by a single librarian and contained 15,000 volumes. Today, the library, a centerpiece of the law school campus, houses more than 2 million items.For much of its history, the library’s mission has included actively collecting, preserving and making freely available materials that are in danger of being lost to time or cultural conflict. The library has served as a repository for the papers, photographs and community ephemera that document the school’s history and traditions. Part of the special collections includes rare books and early manuscripts according to this part of the website: “The Rare Books & Early Manuscripts collection contains over 100,000 printed books, pamphlets, broadsides and other material, with imprints between the fifteenth and twentieth centuries.” One of those works is pictured below – a rare illuminated law book. For more on this unique and beautiful library and its wonderful law collections, visit the link below or the Harvard Law Library one above. Once again it is National Library Week (April 8-14) according to the American Library Association (ALA). This is a time to celebrate libraries and the role they play in the life of our country, our communities, our churches, and our families. About eight-in-ten adults (78%) feel that public libraries help them find information that is trustworthy and reliable and 76% say libraries help them learn new things. Also, 56% believe libraries help them get information that aids with decisions they have to make. On each of these questions, Millennials (those ages 18 to 35 in 2016) stand out as the most ardent library fans. Young adults, whose public library use is higher than that of older Americans, are particularly likely to say the library helps them with information. I would be interested to know your own recent reading habits – what is your preferred method of reading? 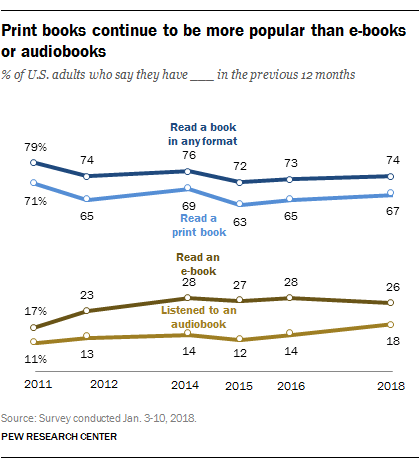 Have you also made a shift to more digital or audio reading of books? Or is print still your #1 choice? As part of National Library Week, today also marked National Bookmobile Day, recognizing that there are many rural places that do not have their own libraries but have access to library resources because of mobile libraries. We applaud this library means and those who see to it that children and adults have access to good books in this way. I hope you too will join me in expressing gratitude for the role that libraries have played and continue to play in our lives, whether you work in one or visit one. And I hope you do the latter – visit a library near you and make use of its valuable resources, including your friendly librarian. I also want to add that I am grateful every week for the Association of Christian Librarians to which I belong. What a wonderful group of people to be connected to – for prayer and devotions, for support and assistance, for encouragement in the pursuit of excellence in our profession! All in service to our fellow Christians and our neighbors, and all for the glory of God. *UPDATE: I might add in this connection that I am also excited about the library news out of my own community, Georgetown Township. Earlier this year the township board approved plans for a new library where the present one sits (on Baldwin St. between 12th Ave. and 20th Ave.). A rendering of the proposed building was released this week also. Good to see our community places a high value on a library! When was the last time you made a visit to your local library? Last month we began to highlight the 400th anniversary of the “great” Synod of Dordt (1618-1619), which begins this year and will extend into next year. In our initial post we simply called attention to some general things. In this post I want to begin to call attention to some of the special books we have in the PRC Seminary library on the Synod and its work, including, of course, books on the Canons of Dordt, which set forth the distinctive doctrines of the Reformed faith over against the Arminianism that the Synod was called to contend against (This latter type books we will feature at a later time.). One of those special books is found in our rare book case and is a 1621 edition of the Acts of the Synod of Dordt (cf. outside binding above and title page with familiar drawing of the delegates below). Yes, you read that correctly – a 1621 edition – printed only two years after the Synod had ended. As you may guess, this work is in Dutch and in old script, which can make it difficult to read. But, you can certainly make out some of the words, especially on those pages where the various delegates are mentioned from the states and provinces in the Netherlands (cf. pages above and below). Those of us in West Michigan will recognize these provinces because they also are towns found nearby – Drenthe, Overisel, Zeeland, Holland (north and south), Graafschap, Zutphen. You may notice that the names and the descriptions of the men are Latinized (that is, stated in Latin), which was the language of the church at that time yet. The page below shows some familiar names at the end of a section of addressing the articles of the Remonstrants (Arminians). That’s it for now – although I might add that a “new” article on the Synod of Dordt has been added to the PRC website – “Our Debt to Dordt” – by one of our current professors, Ronald L. Cammenga. Be sure to read that for more information and inspiration on how Dordt impacts us today. In one of Atlas Obscura’s recent email listings, this hidden gem of a rare-book library right here in the U.S. was featured. Specifically, the curator of the Boston Athenaeum, (whose motto is literarum fructus dulces – “sweet are the fruit of letters”) Stanley E. Cushing, was featured, having spent 47 years in the library. Below are the opening paragraphs of the story of his work in this special library. Find the rest at the link at the end. The Boston Athenaeum—a 211-year-old independent library in the center of Beacon Hill—is home to about 150,000 rare books. Some are old, and some are brand new. Some are huge, and some are tiny. Some are made of lead, some are made of shredded army uniforms, and one is, famously, made of human skin. Until recently, Stanley Ellis Cushing was in charge of all of them. Cushing began his career at the Athenaeum in 1970, right after he graduated from college. He ended up staying for 47 years—“longer than anybody else in the last hundred years or so,” he says—working as a bookbinder and conservator, then as the Chief of the Conservation Department, and finally as the first-ever Curator of Rare Books. While in this last position, he began the library’s artists’ books collection, and took the opportunity to scoop up everything from bark cloth catalogs to anti-war tracts.